After hosting Thanksgiving for the first time this year, I got even more excited about Christmastime and starting fun new traditions for my family. 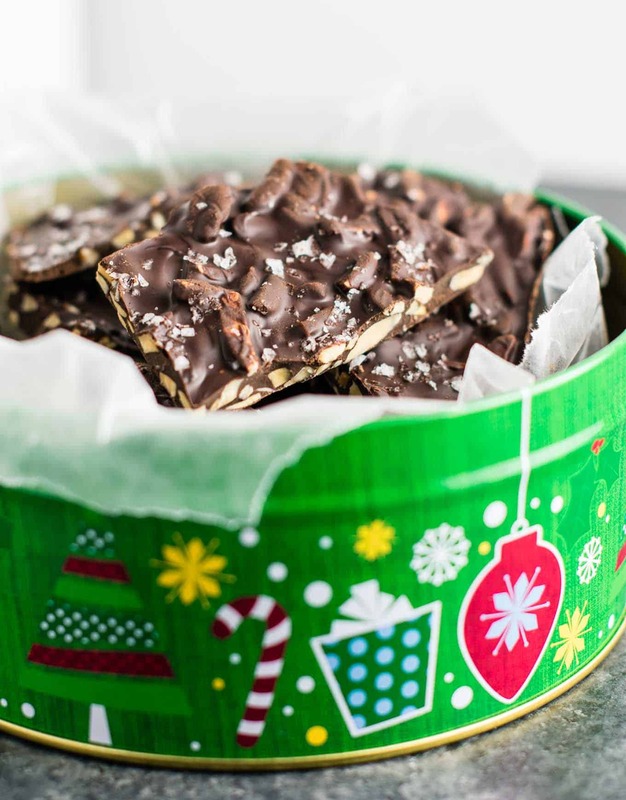 My favorite traditions revolve around recipes, and I knew that I wanted to create some more easy and delicious holiday recipes that we can make every year! 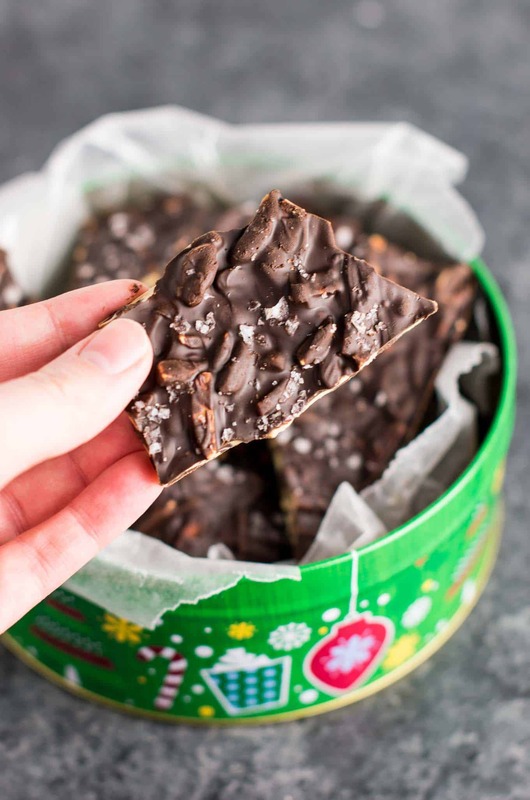 This chocolate almond bark is one of my new favorite recipes for the holidays. 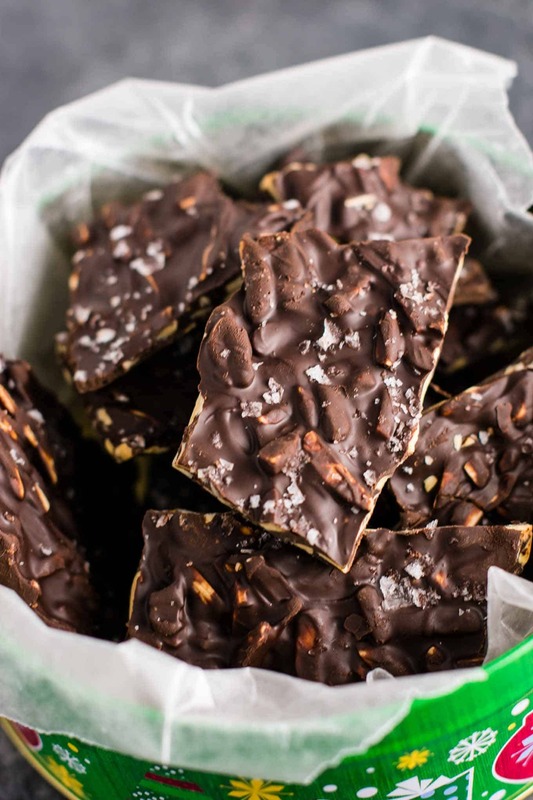 It is incredibly addicting, so simple to make, and tastes like a fancy treat! This recipe also happens to be vegan and gluten free, so it can be enjoyed by all. Line a cookie sheet with parchment paper and place the slivered almonds down and spread out so that they lay flat. Bake at 350 degrees for 8 – 10 minutes, checking often, until toasty brown but not burnt. 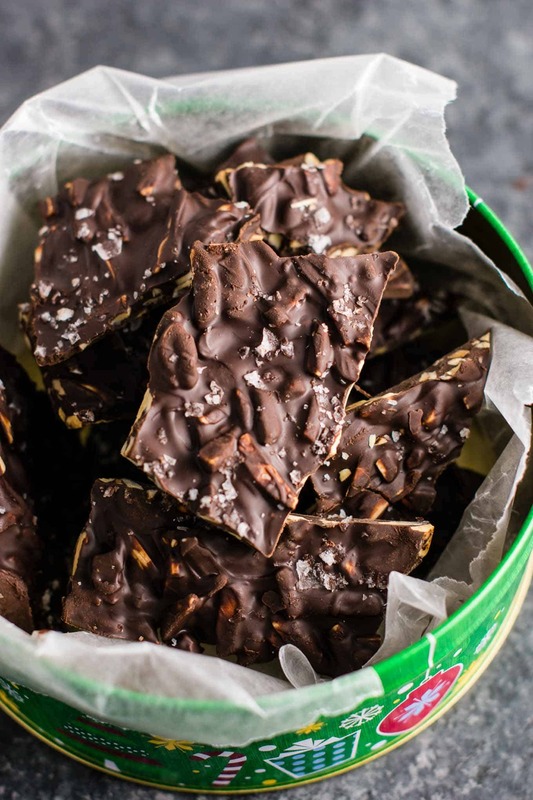 In a saucepan or double boiler, add coconut oil, chocolate chunks, and vanilla extract. Stir on low heat until completely melted (be careful not to burn). Add in almonds and stir to combine. 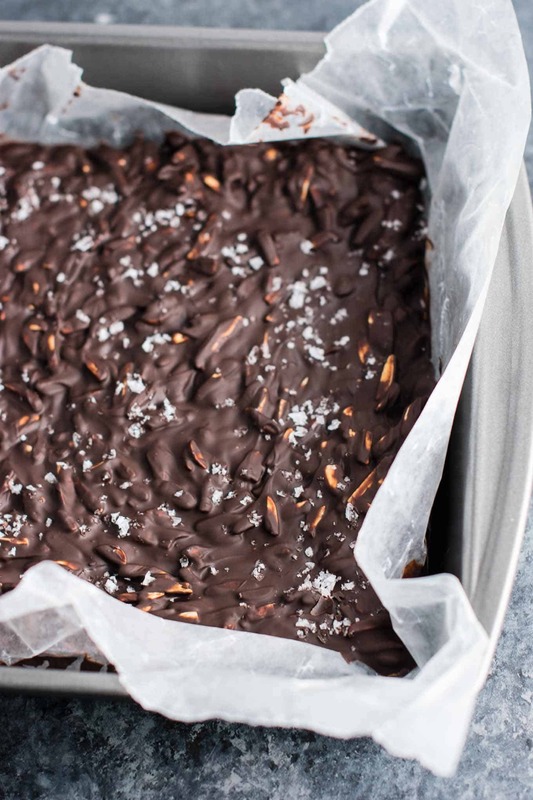 Line an 8 by 8 baking dish with wax paper and pour in the chocolate almond mixture. Sprinkle with flaked sea salt generously. Refrigerate for an hour, or until set. Break into pieces and store in the fridge or freezer. This recipe is everything a good dessert should be: easy to make, limited ingredients, and knock your socks off delicious. 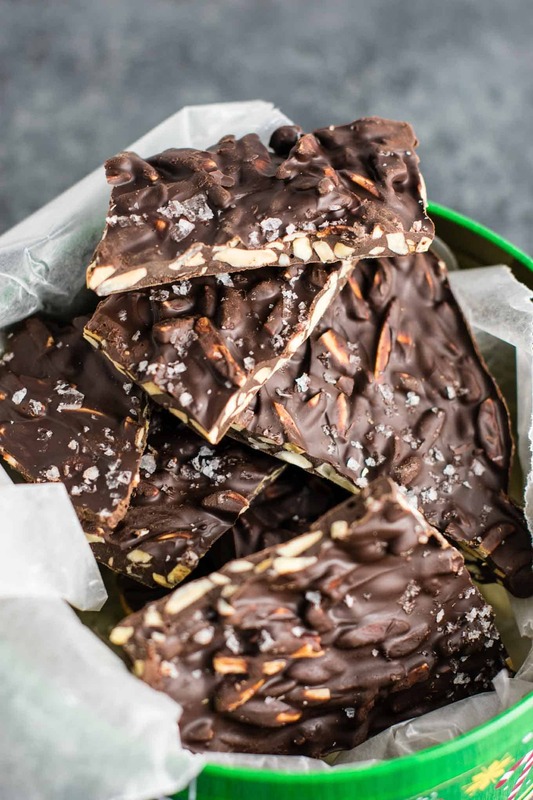 The flaked sea salt on top is what gives this a huge wow factor and it’s my favorite part of this almond bark! I also toasted the almonds first to give them a nutty rich flavor. It doesn’t take very long and really adds great flavor. 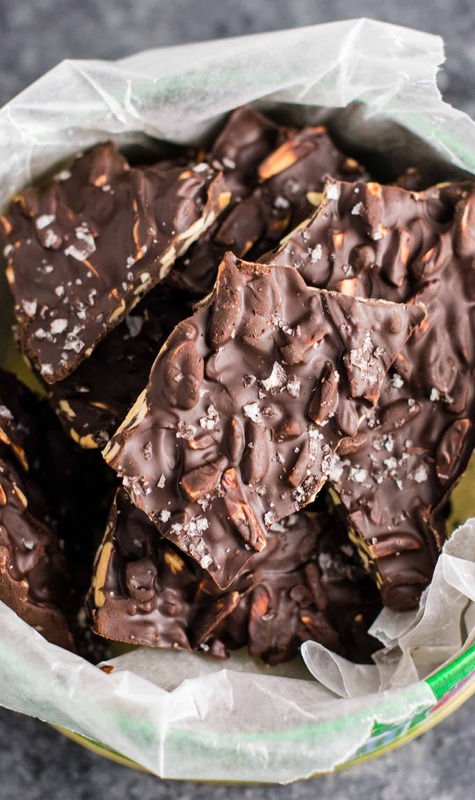 I’m not normally an almond person, but I DEVOURED this bark. I’m not a fan of desserts that are huge chunks of nuts. While they can be delicious, my teeth don’t appreciate the hardness and stuff getting stuck in them. 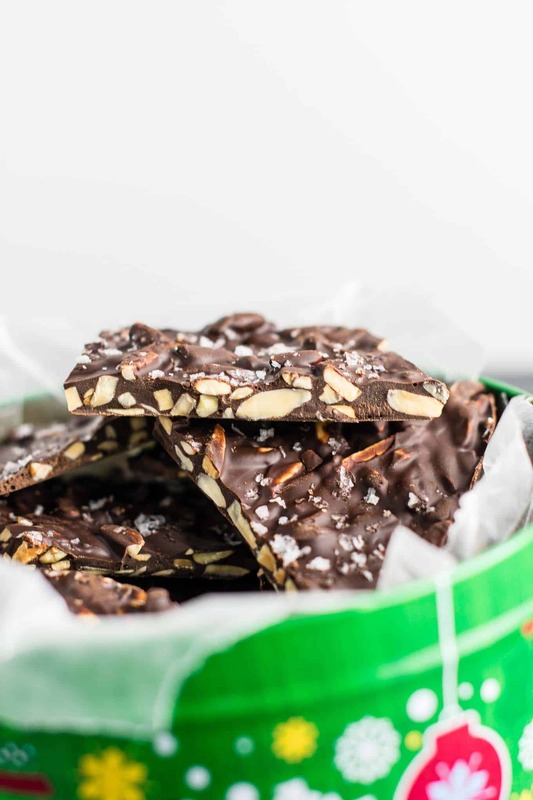 That’s why I used slivered almonds in this recipe – they give the perfect amount of nuttiness without any big bites getting stuck in your teeth. 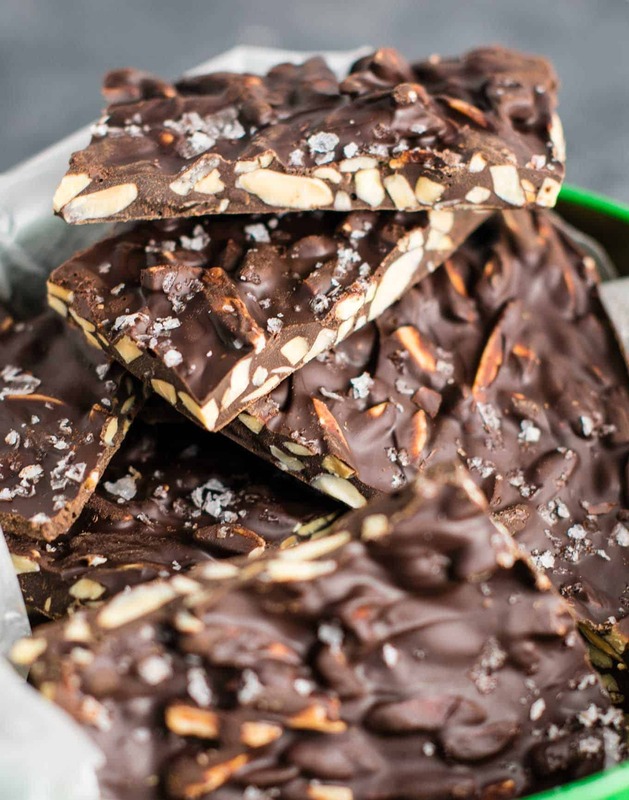 This almond bark is easy to chew and the perfect amount of crunch! This is definitely a staple for us now. I cannot wait to make it for a Christmas party this weekend! I usually make a double batch because it is gone in a hot second. 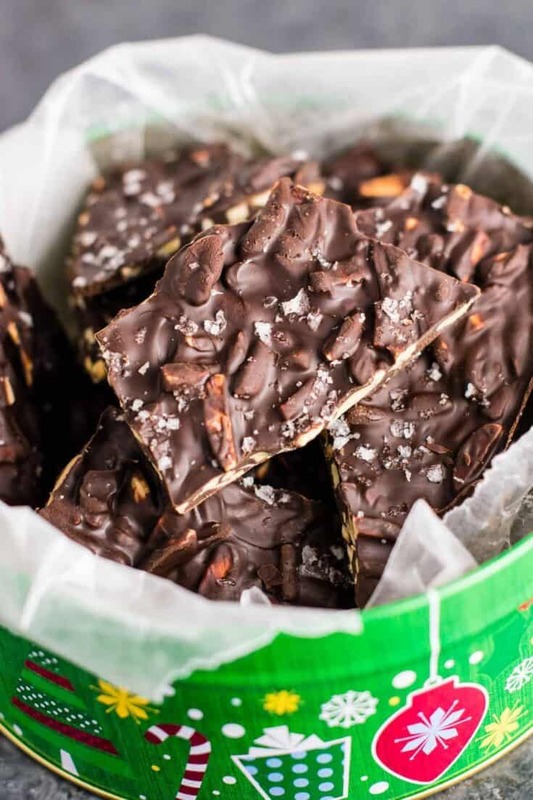 Everyone goes crazy for this recipe! Honestly I don’t think a single batch would last 5 minutes with a crowd! If you double the recipe, you can use a bigger dish such as a 9 by 13 to make it easier. Or you could just use two 8 by 8 dishes, whichever you have! Let me know when you try this and what you think! Just leave a comment or review below! 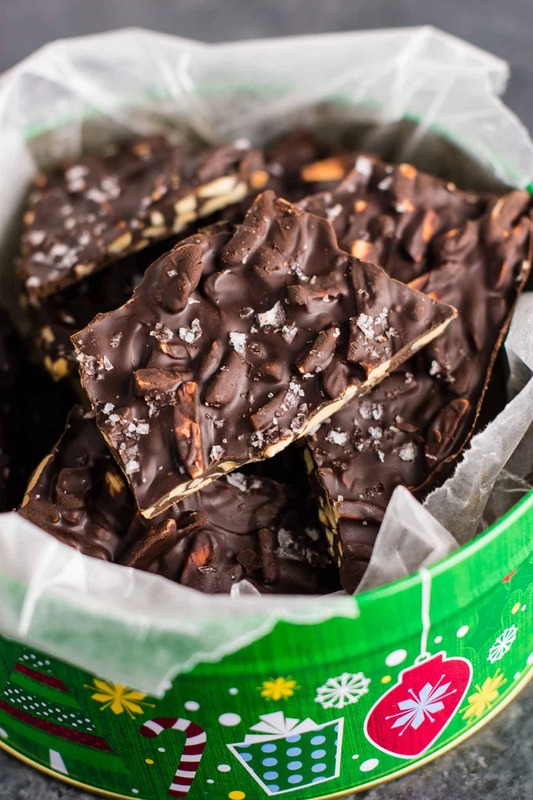 Looking for more no bake treats this Christmas? 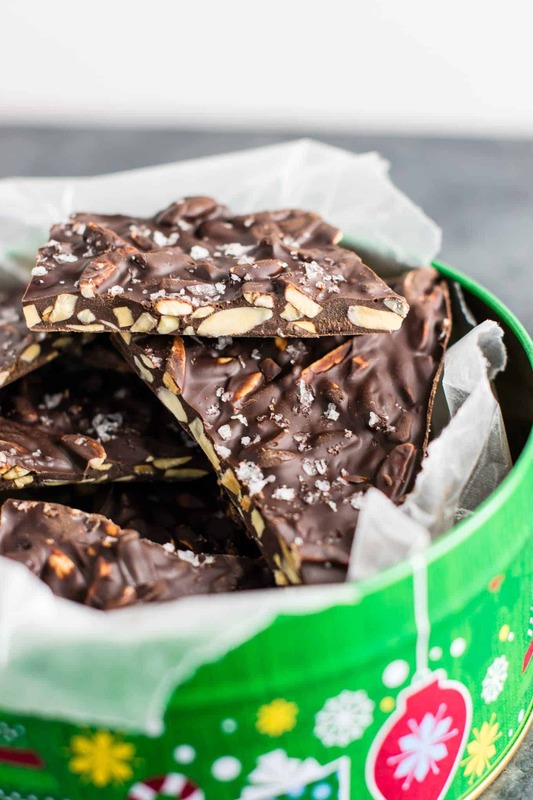 Easy and addictive dark chocolate almond bark recipe with chunky sea salt flakes on top! 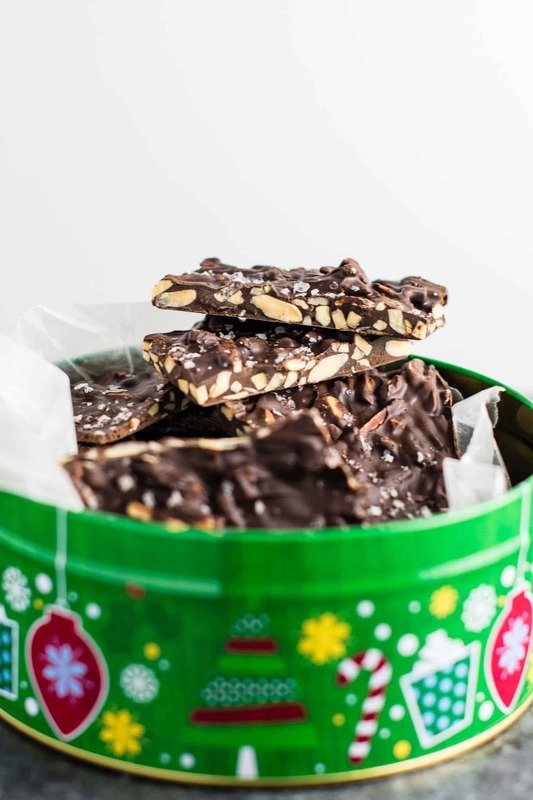 These almond barks look delicious and just great for Christmas! Recipe looks amazing. I was wondering if I can use raw cacao powder instead of the chocolate chips? If yes, what quantity should I use? Raw cacao powder has not been tested with this recipe, so I cannot say if it would work or not. Made this for a Christmas party and everyone loved it!